We’ve been busy at Fine Framers with another Military Medals Framing project – one of the many specialist medal framing services we provide. People with a distinguished military service career are justifiably proud of their medals. We are always equally proud to design and create a custom frame display solution for them. Our customer this time had served with the Defence Forces for many years. His career included several international UN peacekeeping missions. He brought us a collection of medals, badges, and emblems, and asked us to frame them appropriately. As always, we first tried several lay-outs, before deciding upon the one that we and the customer liked best. It features five ribboned medals alongside each other in a designated display area, against a deep red background to highlight these medals in particular. We placed other badges and emblems both above and below this section. Pride of place at the top of the display went to the office Óglaigh na hÉireann (Irish Defence Forces) badge. A United Nations badge is also prominent lower down. We also agreed textbox positions and labels for the display (please note the labels are not shown in the photo here, so as not to identify the customer). Then it was on to the real intricate work! We created a mounting system with our hallmark precision. As regards the items themselves, we used conservation framing techniques so as to protect them over time. This included hand-stitching them to the backboard, to avoid damage from glue or other substances. We also used conservation grade glass in the display, to protect them from UV rays and moisture over the years ahead. Our customer was already proud of his collection. 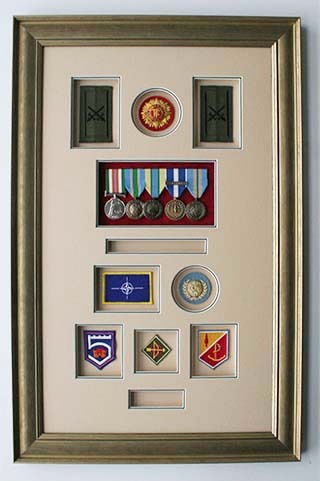 He is proud now too to have such an attractive and high-class military medal framing solution to display them in. And we’re proud too, of yet another job well done! 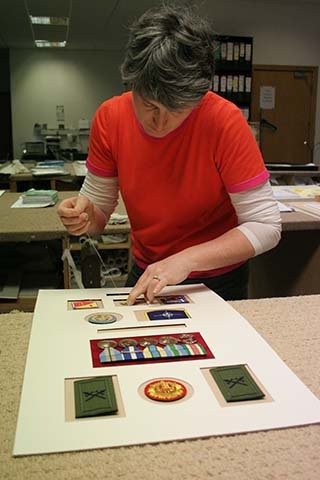 Military Medal Framing is just one of the many Medal Framing services we provide. If you or a family member has a proud medal collection, and would like an expert and tailor-made framed display, just get in touch with us. We’ll give your medals and other items our trademark care and attention, and produce an attractive display for you too.